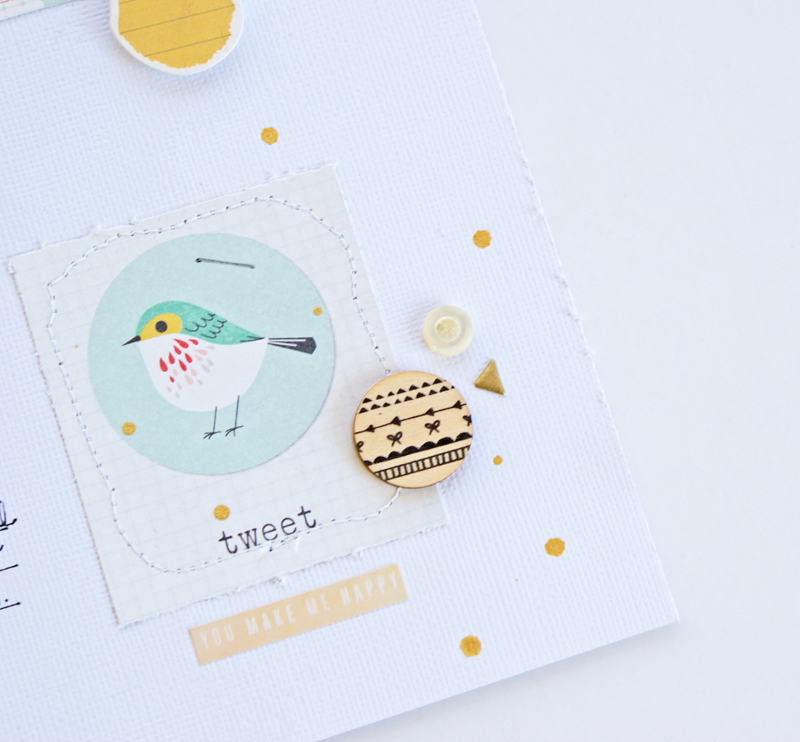 Welcome to my stop on the September Gosssamer Blue Inspirational Blog Hop! 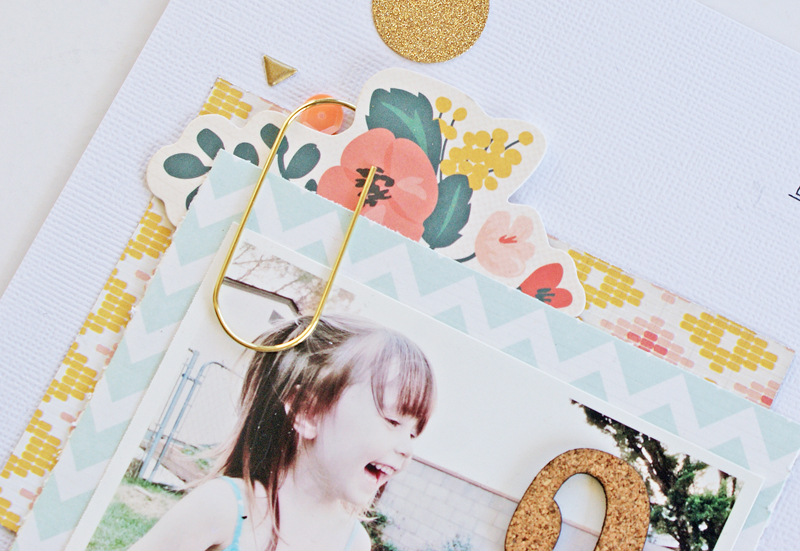 Lately I have really been inspired to try and layer more embellishments to create focal points. Usually I am a "less is more" kind of a scrapper, but I have been craving a little bit of change and this is one way I am going about doing that. 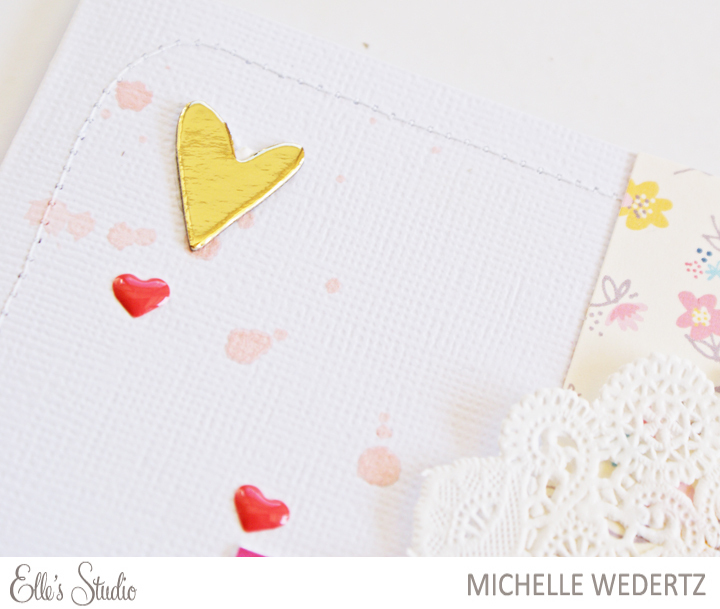 You can see here that I mixed up my embellishments with diecuts, stickers, flair, enamel dots, puffy hearts, and sequins (that already have adhesive on them!). 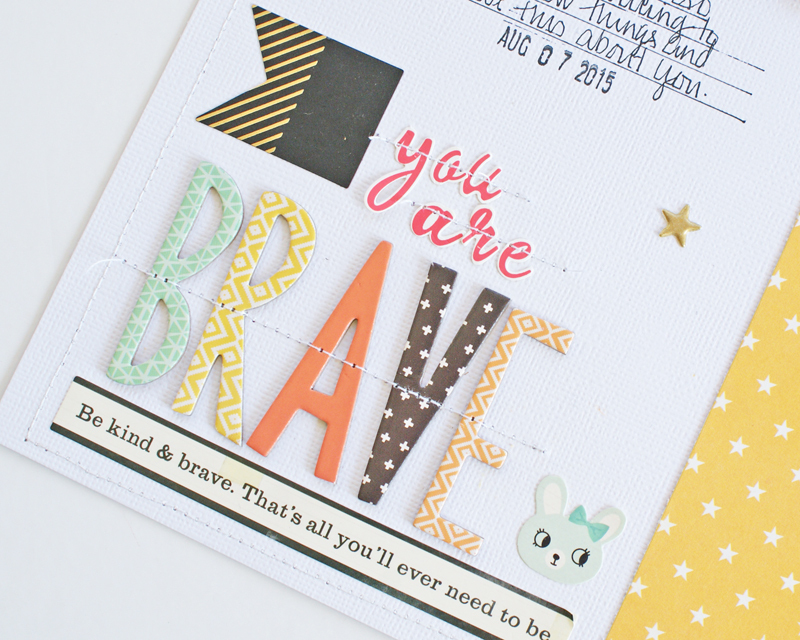 This month the kits also provided a great mix of alphas and words/phrases such as the yellow "cute" from Crate Paper and teal letters stickers from Elle's Studio. 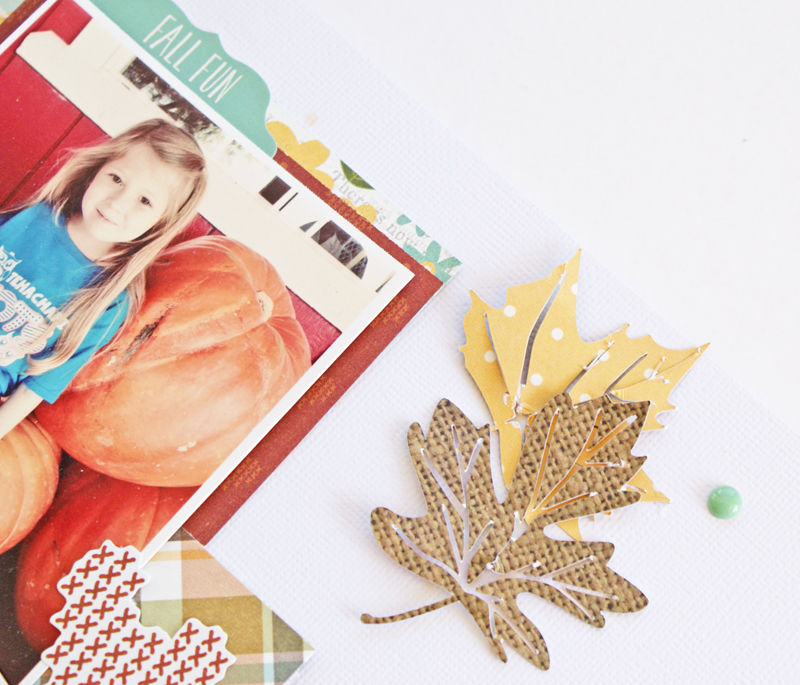 This month I had the pleasure of working with the Pumpkin Spice Collection from Simple Stories for The Cut Shoppe and Simple Stories Product Swap Week! 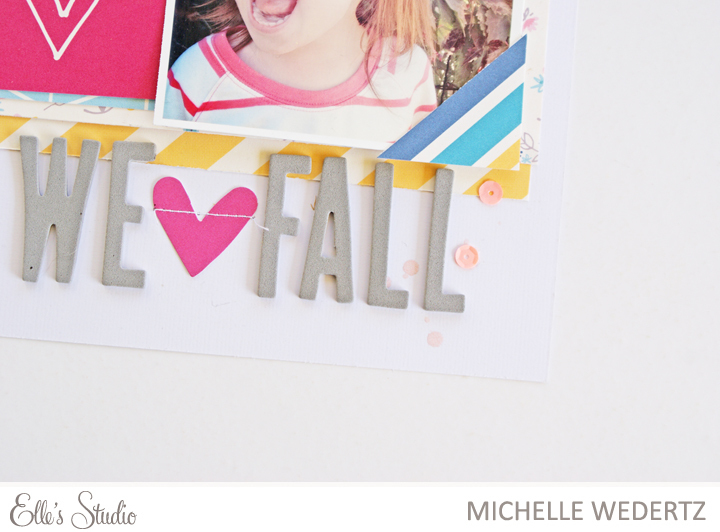 In my opinion, fall scrapping isn't quite complete without my annual falling leaf layout. 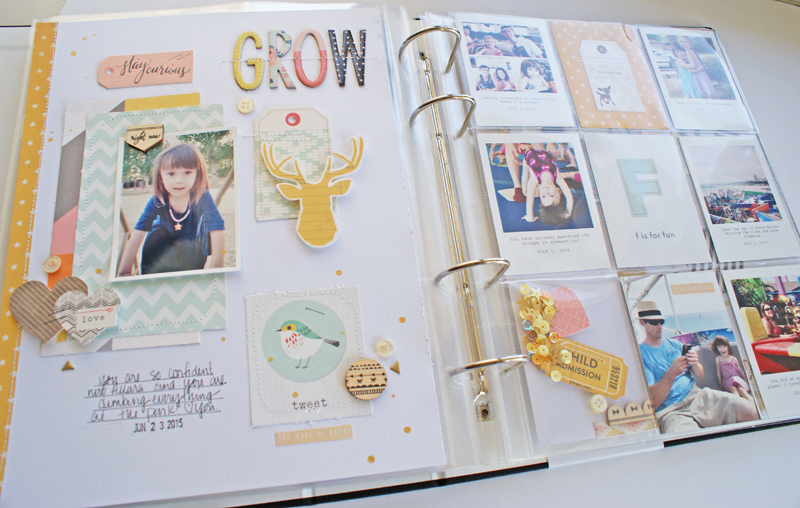 There is just something so fun and whimsical about leaves floating down a page. 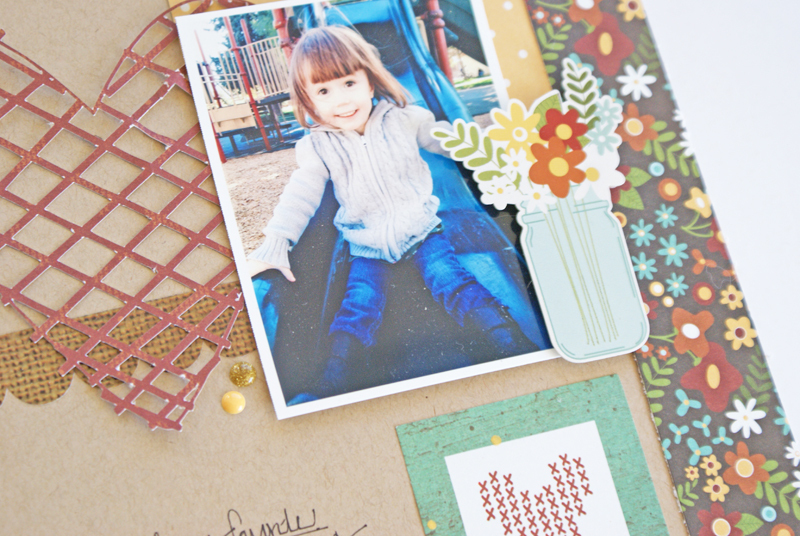 Mix those leaves with the autumn colors of the Pumpkin Spice patterned papers and you have a recipe for a delightful fall page. I like to layer my leaves to mimic how you would find them outside. 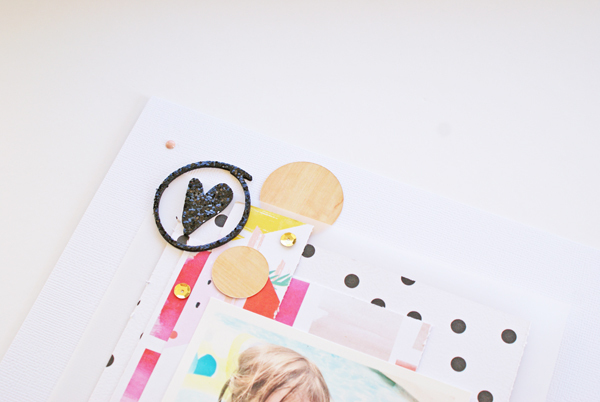 To keep them from looking flat I use a minimal amount of adhesive-just enough to keep them from falling off the page. 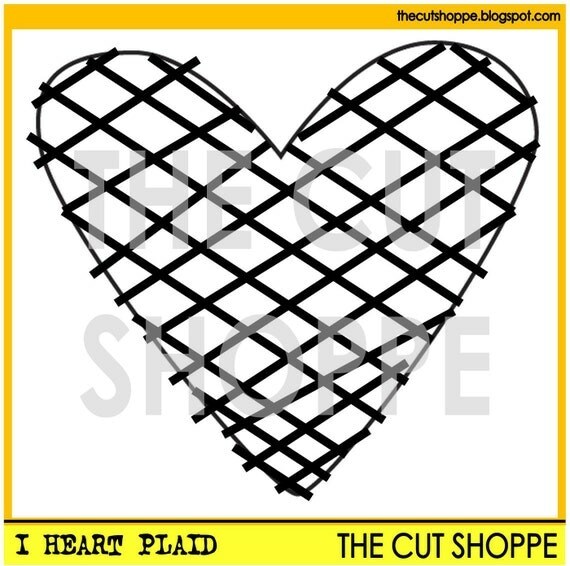 For my second project, I wanted to feature the fun new I Heart Plaid cut file. I decided to use the heart as a focal point to bring the attention straight to this photo of my little daughter. To do this, I resized the cut file in my Silhouette so that it was roughly the size of my 3x4 photo. By simply layering it under my photo the eye is drawn straight to where I want it to go. 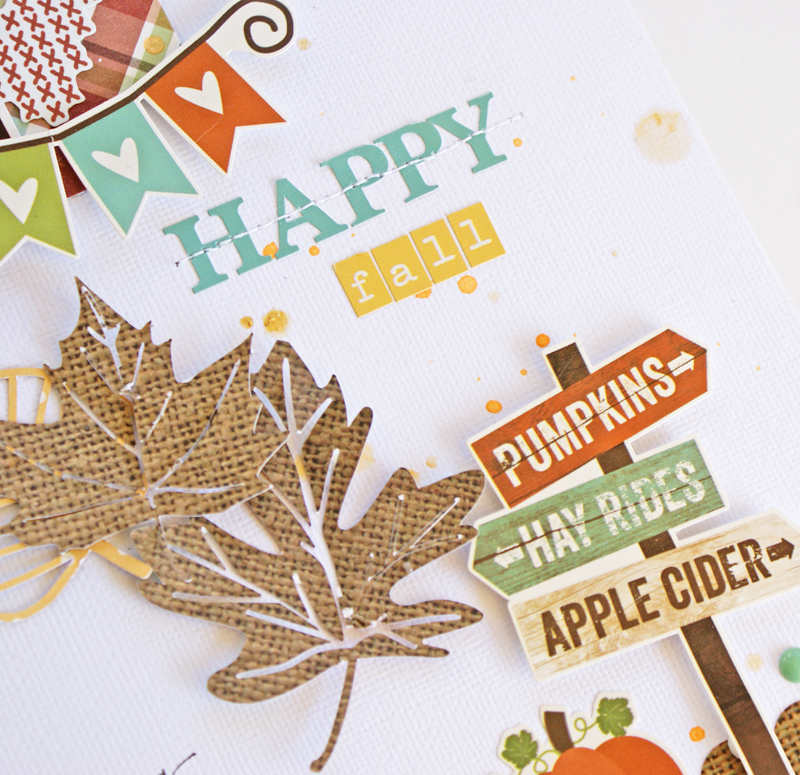 Besides the fun colors in Pumpkin Spice, I really enjoyed using the co-ordinating stickers and die cuts, particularly the pretty vase and flowers. 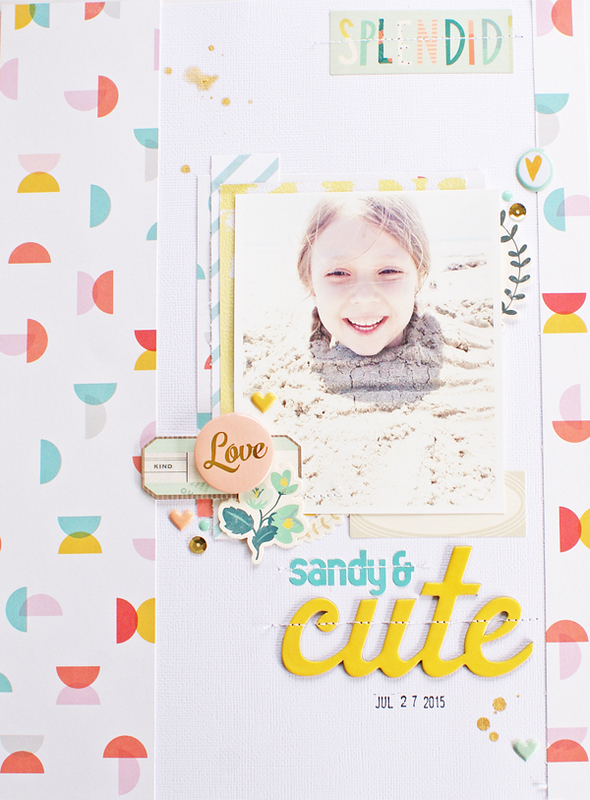 In celebration of this fun team up with Simple Stories, both The Cut Shoppe and Simple Stories are having a giveaways. Yay! 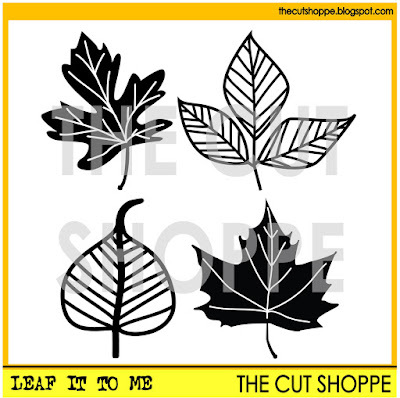 To participate make sure a visit each blog-Simple Stories Blog and The Cut Shoppe - and leave a comment on one or all of the posts from this week and you will be entered for a chance to win some great prizes! Also, in celebration of this fun team up, you can save 30% off your purchase at The Cut Shoppe through next Tuesday! 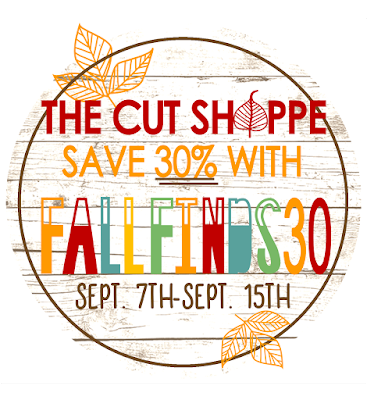 Just use the code FALLFINDS30 when you check out! Hello! 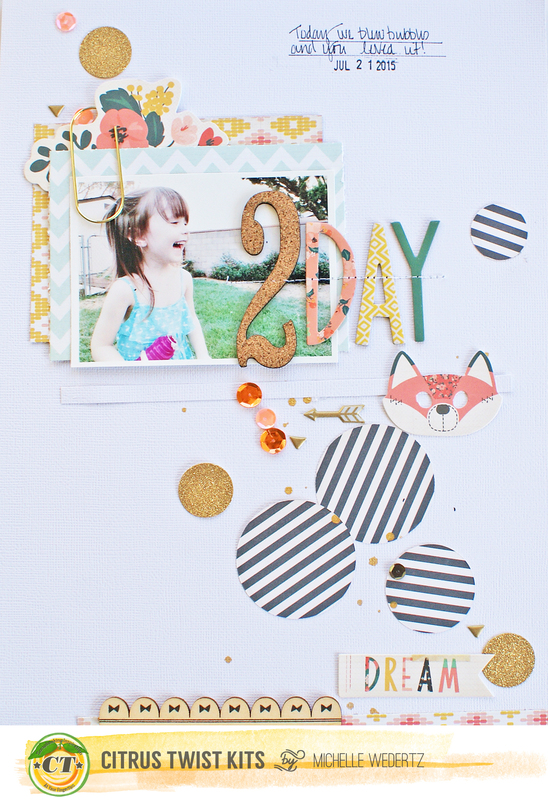 Today I want to share a new layout featuring the "leftovers" from my September Kits from Citrus Twist. This month I flew through the process of making my layouts (A sure sign that the kits were awesome!) and before I knew it, I was left with a small pile of paper scraps. Generally, I am not one to hold on to products that I have already gotten a lot of use out of , but this month I couldn't part with even the tiniest of scraps. Today I am going to show you how I used some of those up. Working from a pile of scraps is a sure fire way to simplify the process of creating for the sole reason that I have little to choose from. Here I had only a few pieces left-two small rectangles, a long paper strip, and left over circles that I had used on a previous project. Since I had very little paper, I went ahead and spread what I did have out across the page to fill as much room as possible. The circles that I laid out in a vertical line are pretty small, but since they are in a bold black pattern, they stand out and add contrast. Having a limited amount of paper on hand meant that I was a little strapped when it came to adding in more color to my layout. 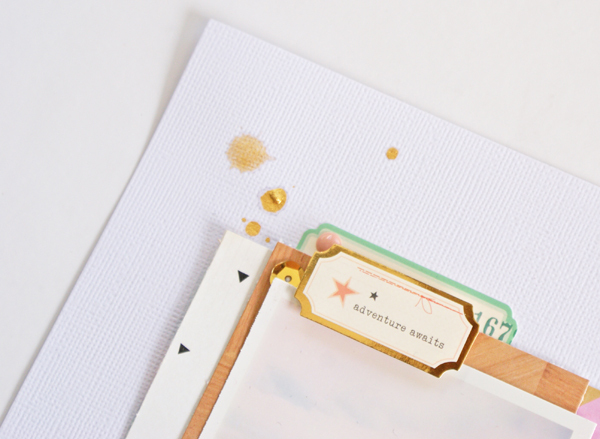 This is where embellishments such as stickers, ephemera, and small pieces such as sequins and acrylic shapes really come in handy. With these I was able to dress my layout up and add in more patterns and colors. Happy Thursday! 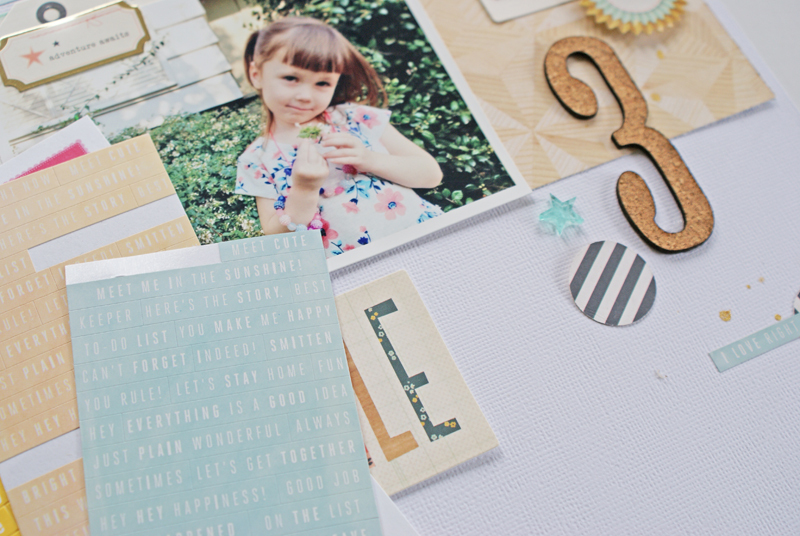 Today is a super happy day because not only is it reveal day at Elle's Studio for September's Kit, it's also the day I get to share my first projects using Elle's new collection Thankful-which along side Elle's new Christmas collection Joyful, is debuting in the shop today! Yay! 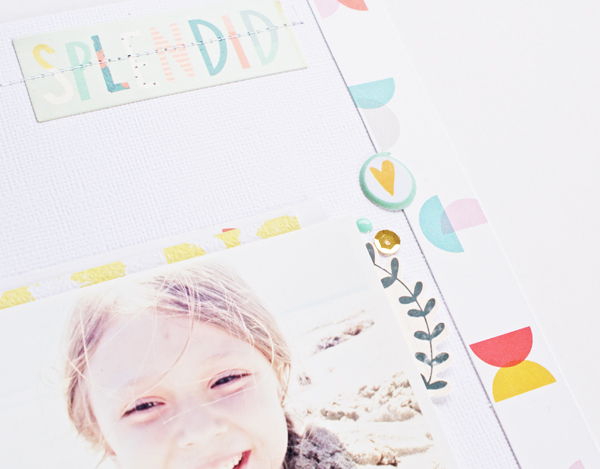 My projects this month are a combination of both Thankful and the September kit. I loved the magenta and blues in the kit and found that they went super well with the pretty floral paper and cork shapes from Thankful. 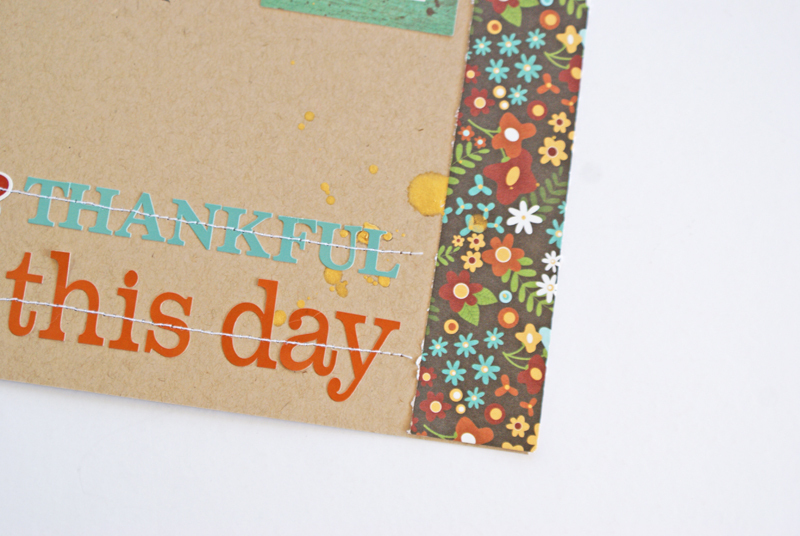 You can see here that Thankful also features a beautiful, warm yellow--one of my fave colors! 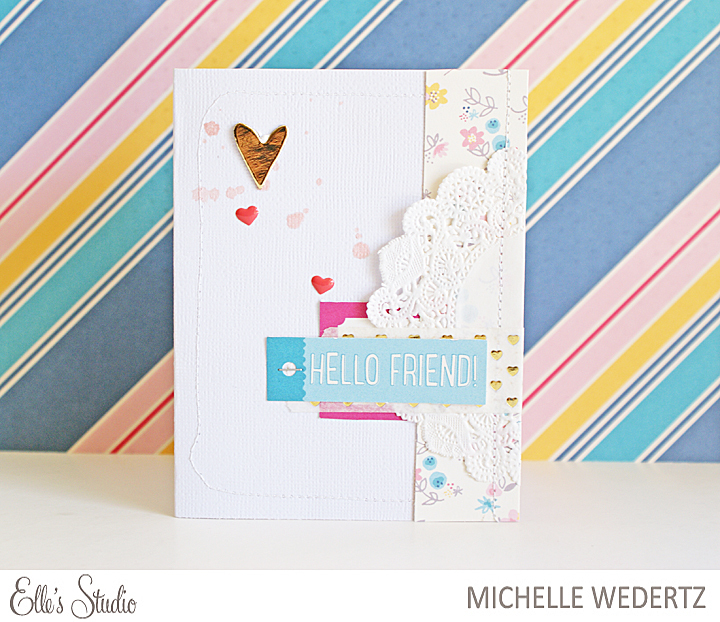 When I saw the "Hello Friend" tag in the kit, I knew it would be perfect for a card. 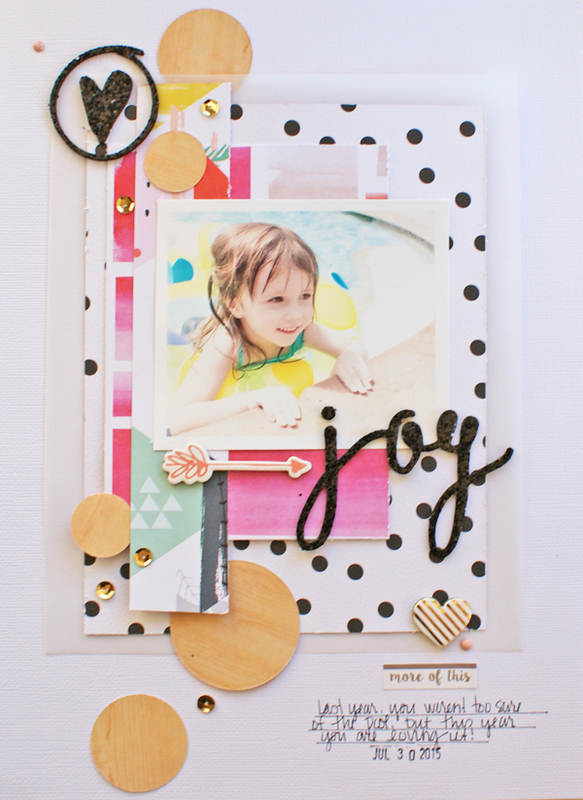 Lots of fun, fun things happening at Elle's today make sure and check them all out! 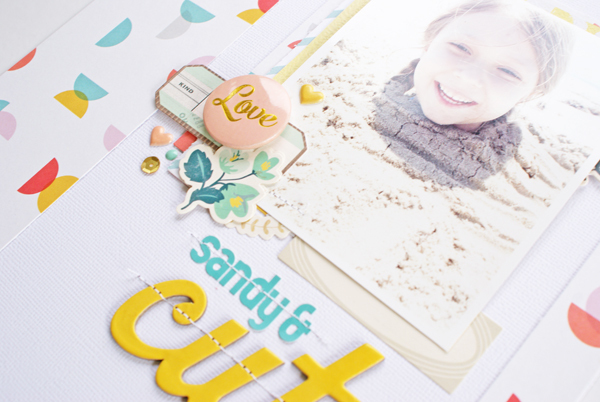 Yesterday, the latest kits from Citrus Twist Kits were revealed! Yay! 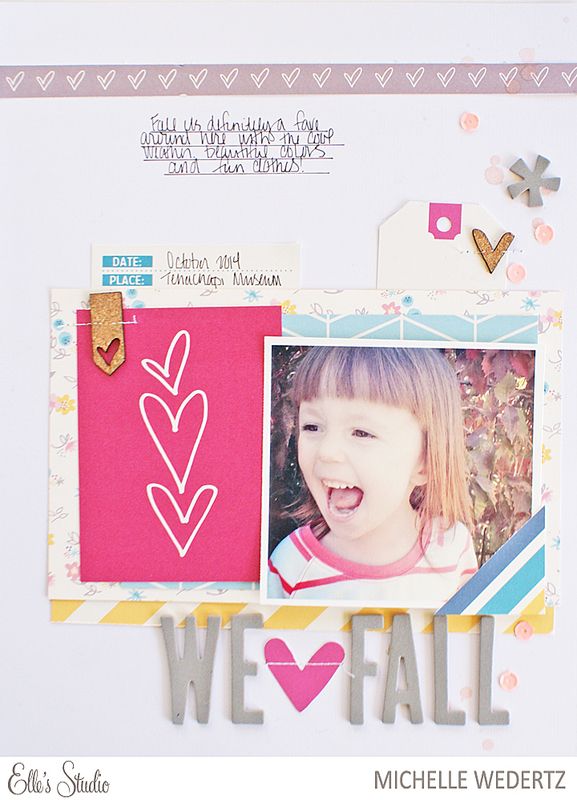 September, for me, is always a great month in regards to scrapping. It just seems that that the kits leading into Spring and Fall always hold so much promise and excitement. At the end of Winter and Summer I am ready for a new season and the kits at these times of year help satisfy that craving for a change of scene and weather. 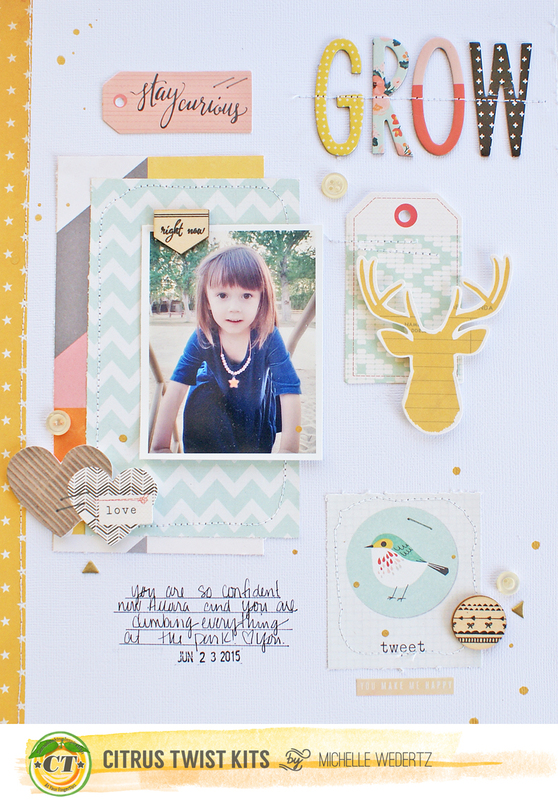 This month's kits features several pieces of Crate's new Wonder collection and I LOVE every single piece of it! 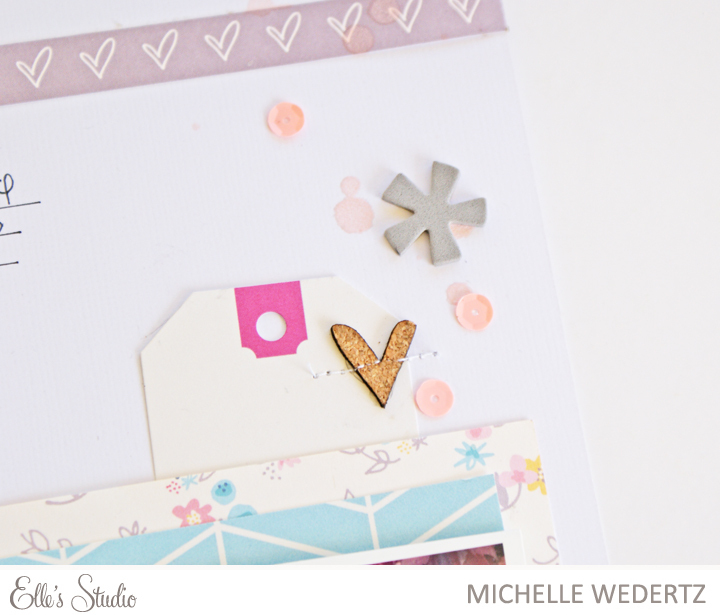 The wood veneer from Pink Fresh Studio came in a close second on my list of faves--they are so detailed and fun. 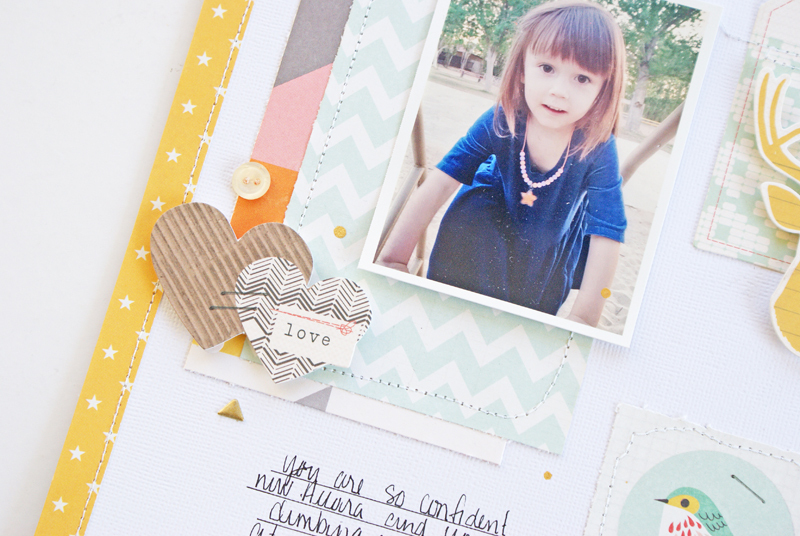 I also included a pocket page to go along side my layout. I used only the Main Kit plus some sequins from my own supplies. This next layout is a combination of the Main and Sprinkles Kits. 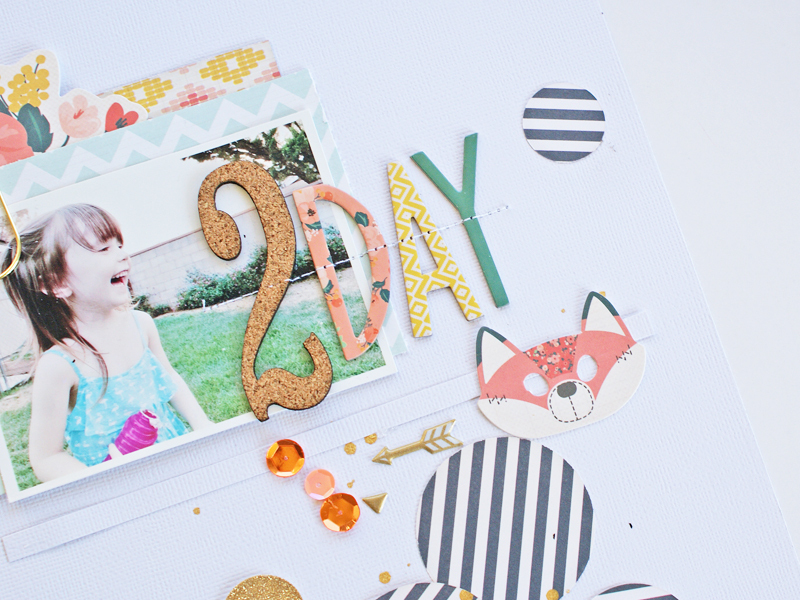 The giant paper clips are such a fun element and I just had to include that little fox! 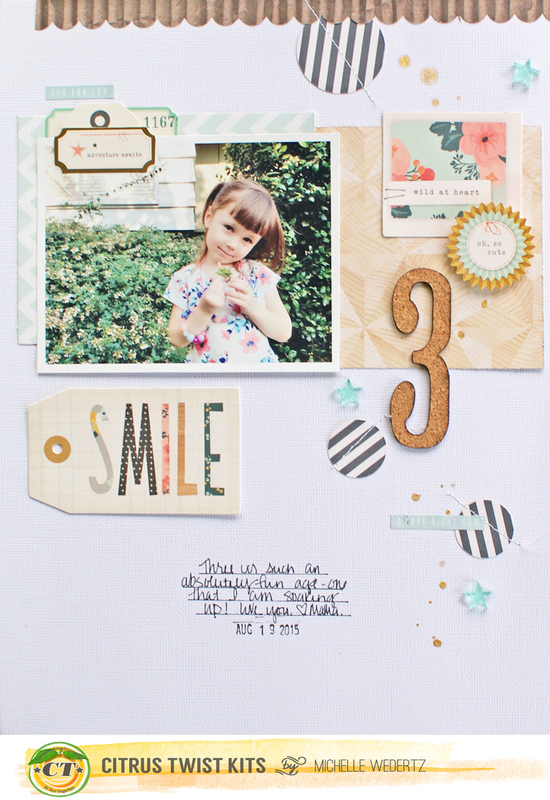 My final layout that I am sharing today is a mix of all three kits and features the stickers from the Embellishment Kit. 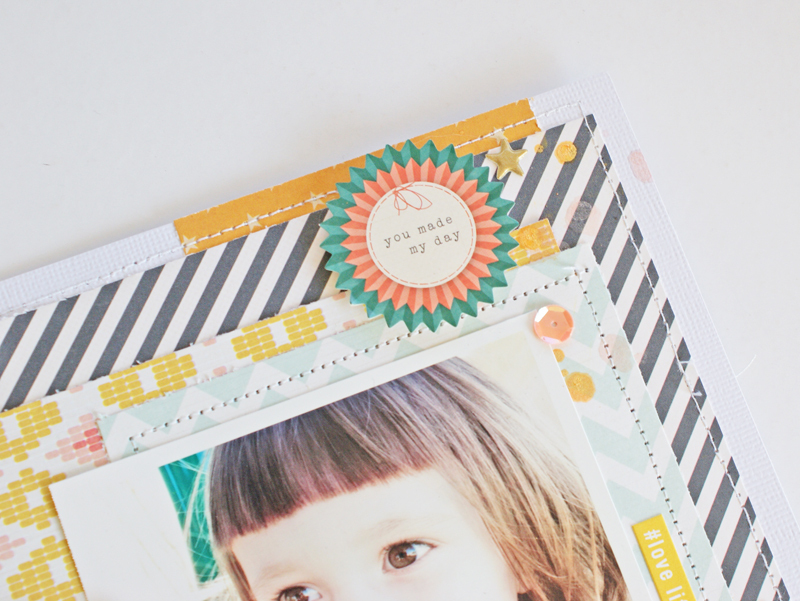 Stickers are always a no brainer for me and I would have to say that they rank right above epherema as my go to embellishment. The funny thing with the stickers though, is that I am always adding pop dots to them to add some dimension, which sort of makes the whole "sticker" part null and void! Haha. And these wonderful alphas---love them! Typically I sort of struggle with mix patterned/colored alphas, but not with these. I think that the colors and patterns just clicked with me. September is certainly turning out to be pretty awesome and I am looking forward to sharing a fourth layout with you next week! Meanwhile, make sure and head over to the Citrus Twist Gallery to see what the rest of the Design Team created! 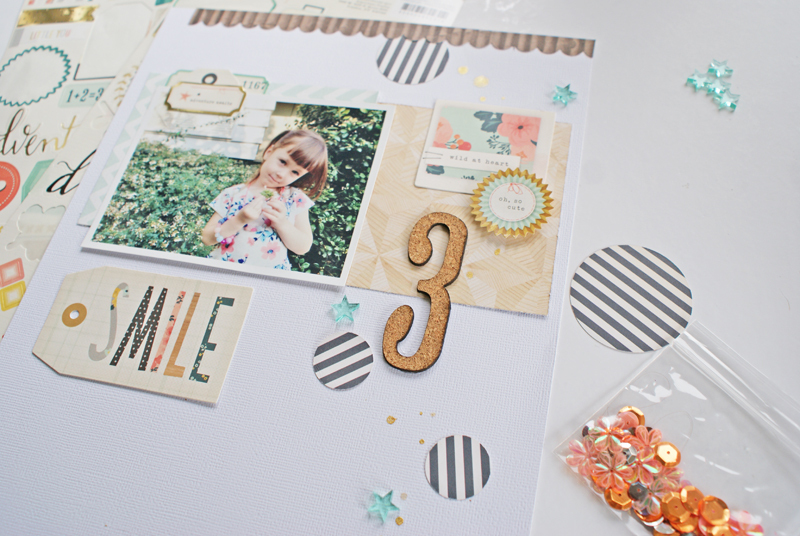 A brand new month brings a brand new set of kits from Gossamer Blue! 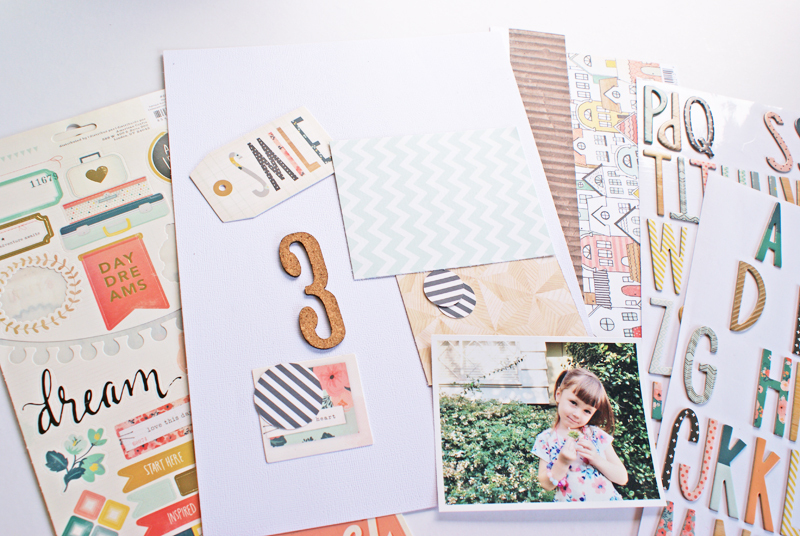 Today I am super excited to share my first two projects with you featuring the September Kits! 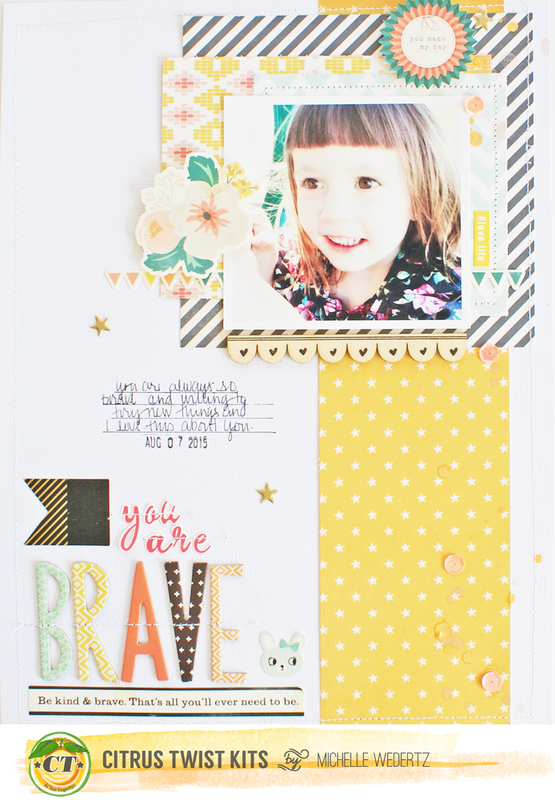 When I opened my box I was beyond excited because the kits include lots of items on my scrappy wish list! 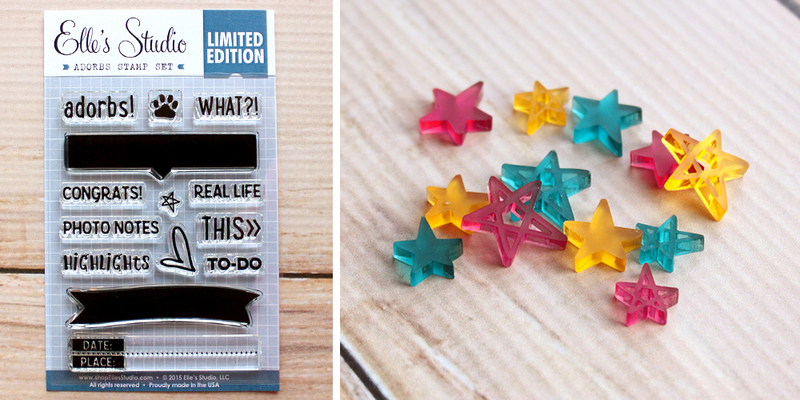 You see, I have almost come to terms with the fact that I really don't need to buy any extra scrappy supplies outside of the kits because what I want ALWAYS shows up in a kit! I just need to wait patiently ;). 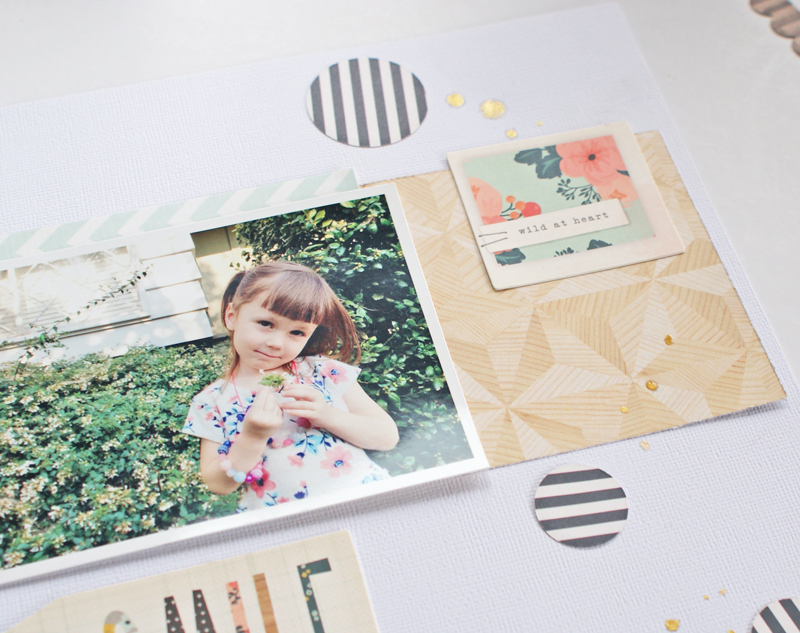 September's kits are a beautiful way to wrap up the summer season as we head into fall. If your anything like me, you are still in the middle of scrapping all things summer, but are really wanting to dive into fall already. 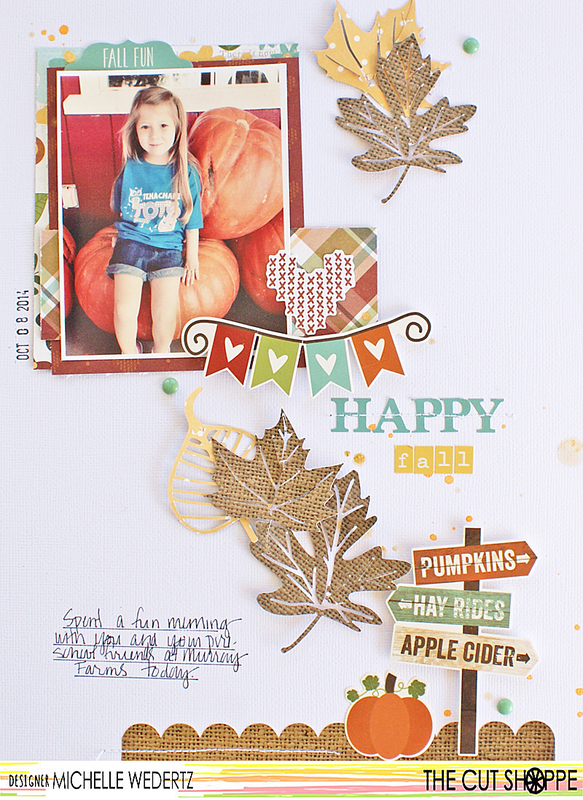 This month's kits gave me that taste of fall while still being able to scrap summer. 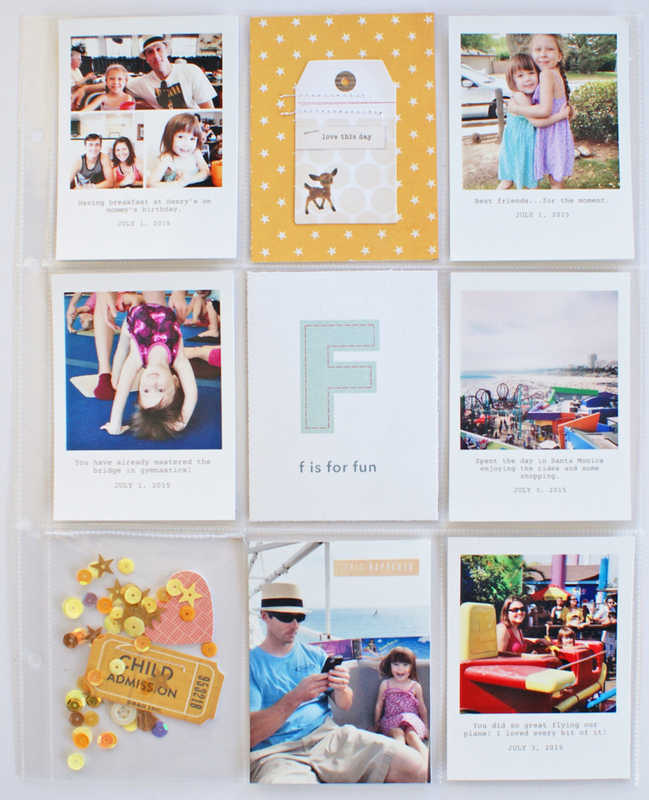 The beautiful combination of products from Crate Paper, Pink Fresh Studios, Fancy Pants, and Elle's Studio have me steadily feeling creative and excited about documenting my memories. 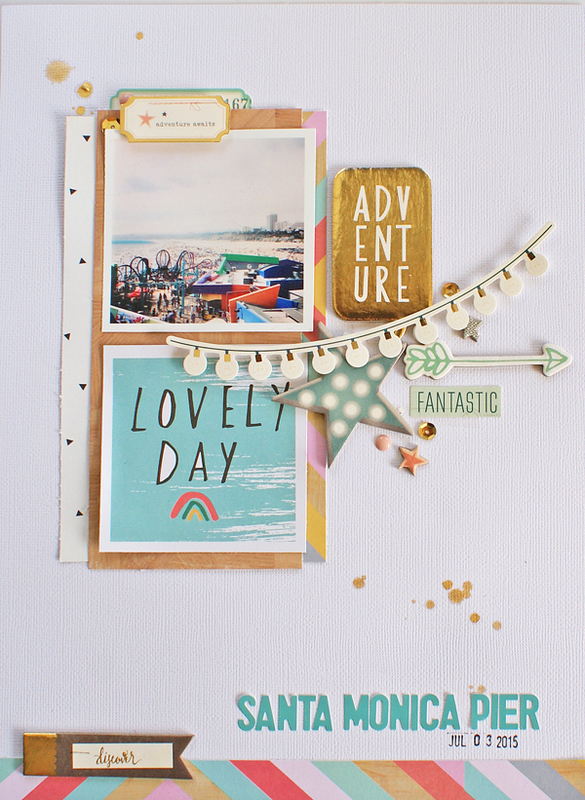 For this layout I wanted to build a big cluster of embellishments and the stickers and chipboard from Crate's Wonder made this so easy. 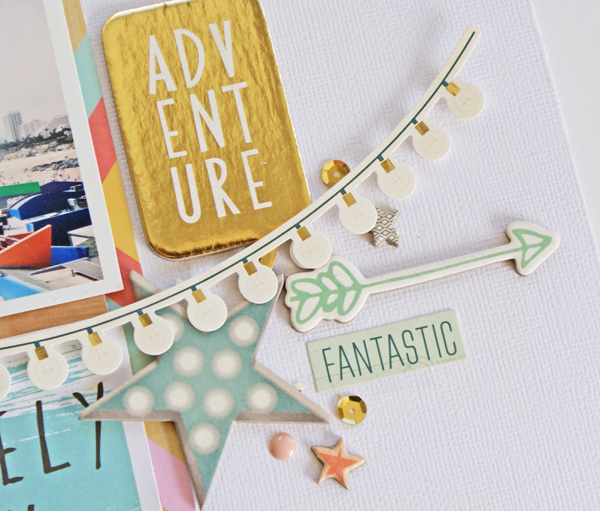 I especially loved the string of lights sticker-so fun and I wish I had more. I found myself super inspired by the polka dots on my daughter's floatie and let that guide me in picking out my papers and embellishments. I also cut some circles out of the wood grain paper and had them up float up in a vertical line. 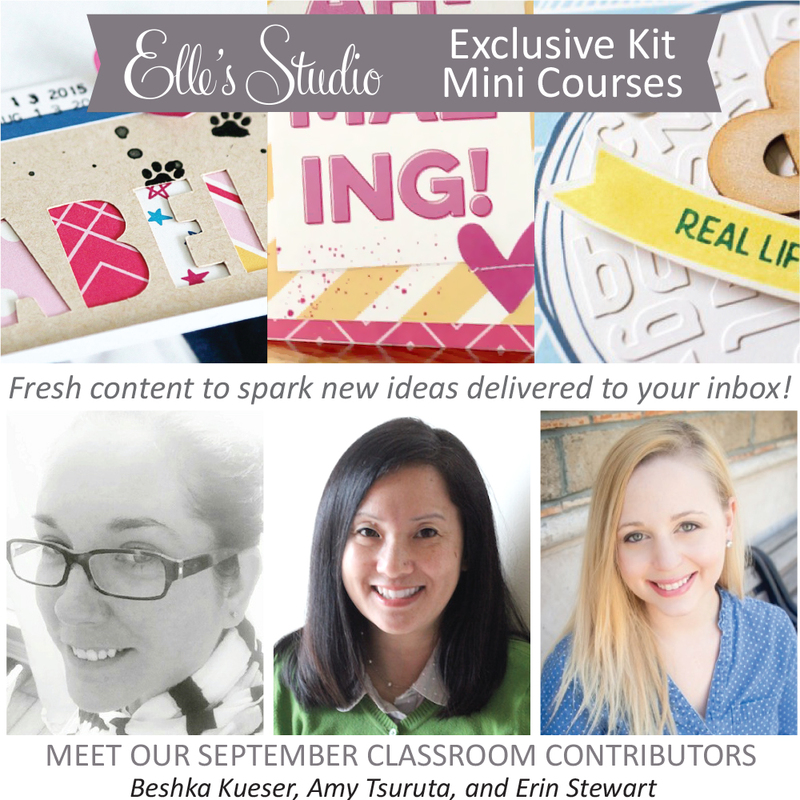 As I said earlier I have been super inspired by September's Kits and I am really looking forward to sharing the rest of them with you soon! To see the rest of the design team's September projects make sure and stop by the Gossamer Blue Gallery!